This photo of I-1 #1001 leaving the station is the only photo I have from this perspective. Another Kent Cochrane photo, the date is unknown but c1946-7. The first car behind the locomotive is a coach converted from the Besler steam train. It was a streamlined trainset that consisted of a combine power car and a coach. Some amazing footage is available on YouTube. Frequent mechanical failures resulted in the railcar being converted to a combine and the coach in 1943. Crown Custom imported the railcar along with the ex-Besler combine and coach. I have the coach. Although the second head-end car looks more like a baggage car than an RPO and #472 is the only one that I'm aware of that would be hauling a second one, I don't think it's that train as it arrived in New Britain at 8:24 PM, picked up the storage mail for the day, and left at 8:30 PM. This would be the wrong place to be taking a photo at that time of the evening, and the shadows are all wrong. The heavyweight looks like one of the classes that is a match for the NKP brass coach identified as an O&W coach. This is probably the best photo that includes the crane assigned to New Britain, and is enough to confirm that it's the same type as seen in a Shoreliner article on Fall River. More on that later. 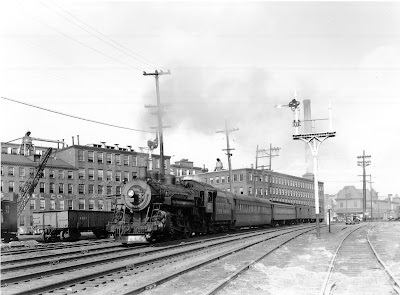 The gondola is an older class of 6,500 hopper-bottom gondolas built for the New Haven between 1906 and 1911, and rebuilt in the mid-twenties. A nice picture of a group of these rebuilt cars in May 1925 is on pg. 541 of New Haven Power. It appears the hoppers have been removed. I can't make out any detail on the two freight cars, unfortunately. Note the line poles, most of the water column is hidden behind the speed limit sign. Also, the two-story gateman's shanty is entirely out of view behind the train. There's also a very tall light post that I've never noticed before near the station. I'll need to look into that a bit more. These will probably be the only signals on the layout as well, although I'd like to make them operational. There are a few automobiles in the photo, maybe an expert in pre-50 autos can identify them for me? I wonder if the one to the right of the train was Kent Cochrane's? 39-40 Hudson, they had rear fenders that covered much of the rear wheel opening and split rear window. 39 Plymouth, square-ish headlight bezels. 35 Dodge, flat back with spare tire mount (no trunk)trunk models had side mounts,large one piece rear window, free standing headlights. Thanks Joe, that's a great help. It's pretty much a question I have about all of the pictures.